TrueBeam is the new model of medical linear accelerator from Varian Medical Systems. It was cleared by the FDA in December 2009. There was operating prototype at Memorial Sloan-Kettering Cancer Center. The installations of TrueBeam around US started in Spring of 2010. 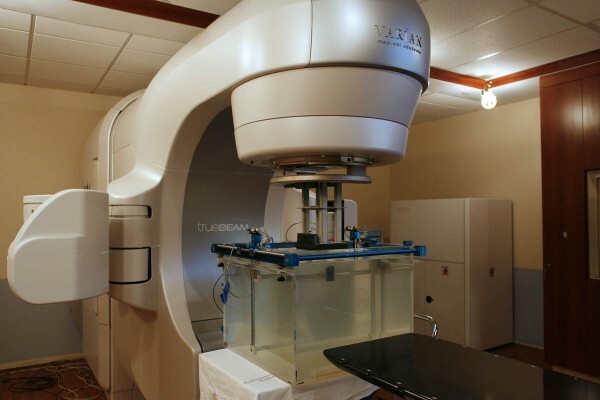 There are two varieties of this linac – TrueBeam and TrueBeam STx. The STx model is intended for stereotactic use and has HD MLC. The older model of SRS linac is Novalis Tx. A new feature for TrueBeam is the availability of the so-called FFF (Flattening Filter Free) mode. The photon beams usually have a metal filter on their path to make photon fluence uniform (or flat). With proliferation of accurate treatment planning algorithms and Intensity-Modulated Radiation Therapy (IMRT) the uniform fluence is not a concern. When the filter is removed from the photon beam, the intensity increases by a factor of 2 for 6 MV photons and by a factor of 4 for 10 MV photons. The Clinac models have a maximum dose rate of 6 Gy/min and Novalis models 10 Gy/min. The maximum dose rate for TrueBeam in FFF mode are 14 Gy/min for 6 MV and 24 Gy/min for 10 MV beams. The filtered modes of TrueBeam still have 6 Gy/min maximum dose rate. Linear accelerators produce radiation in pulses, up to 360 beam pulses per second. The FFF mode does not change the number of pulses, but the dose per pulse increases significantly. As a result, a special attention should be paid to ion chamber collection efficiency during commissioning. The table below shows dose per pulse for TrueBeam photon beams. To access ion chamber collection efficiency, it is convenient to have a water phantom scanning system, such as IBA Dosimetry BluePhantom that allows to set different bias voltages for signal and reference chamber.